Our next stop on what will turn out to be The Stuff Yourself Silly Tour of New Orleans was 13 Monaghan Bar and Restaurant in the Faubourg Marigny. Just east of the French Quarter, the Marigny still has the charming architecture and parks, but is less touristy and a bit more gritty. There are bars that you'd actually want to drink at along with piano and jazz bars every other block. We found 13 Monaghan, a lofty, empty-on-a-Tuesday-at-4pm bar with its front open to the street. We took a seat at the bar, inhabited only by an older fellow who was drinking a beer and working on his laptop, and ordered what we went there to get: frozen irish coffee. After swirling around in a stainless steel daiquiri machine for hours, the slushy latte-colored treat is dispensed into a clear plastic cup, topped with a healthy dose of coffee grounds and given a decorative spiral with a straw. It ain't fancy, and at $4.50 a pop how can you say no? Only after you take the first sip do you realize that this is the best beverage ever created. It tastes like a coffee ice cream/coffee milkshake hybrid with a little something special, except you can't taste a trace of alcohol. But you know it's there, and that's why it makes you so happy. It would be all to easy to drink these all day, every day, for the rest of your life. It combines the best of the breakfast world (coffee) with the best of the dessert world (ice cream) with the best of the alcohol world (whiskey). 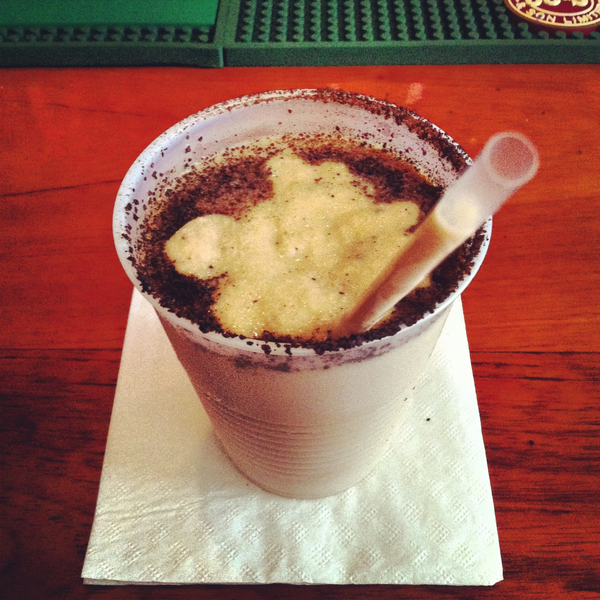 I love you, Frozen Irish Coffee. But it's not meant to be; having you all day every day would make me too jittery, too fat, and an alcoholic. Which is why I had to stop at one. Special thanks to Laura F. (who suggested frozen irish coffees, ya heard) for making this blog post possible!